The Law Firm of Josh N. Bennett, Esq., P.A. Contact Josh N. Bennett, Esq., P.A. 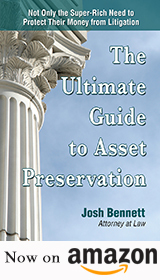 While Josh Bennett can provide protection from most future judgment creditors, no amount of asset planning can guarantee protection from all creditors under all circumstances. In particular, if a creditor has already obtained a judgment against you, or if you have been notified that you are about to be sued, then federal and state laws prohibiting fraudulent conveyance may be applicable. Additional present or future laws may apply to your asset planning as well, and you should therefore always consult an experienced attorney. The information available from this website is not a substitute for legal representation.